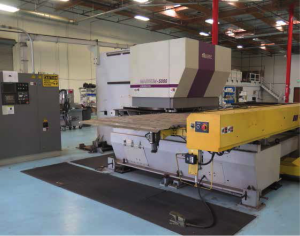 2011 Muratec / Weidemann “Magnum-5000” CNC Turret Punch Press s/n 11KX246270001 w/ Muratec-Fanuc CNC Controls, 38-Station Turret, 2-Indexable Tool Stations, Auto Sheet Repositioner, 200 Punched Holes/Min, 450 Nibble Hits/Min, 60” x 230” Ball Top Table, Slug Conveyor. Cincinnati 375HSx12 3/8” x 12’ Cap Hydraulic Power Shear s/n w/ Cincinnati Controls and Back Gaging, 138” Squaring Arm, 35” Front Support Arm, Digital Stroke Counter, Foot Control. Cincinnati 135 CBIIx10’ 135 Ton x 10’ CNC Press Brake s/n 50784 w/ Cincinnati Controls and Back Gaging, 12’ Bed Length, 8” Stroke, 7 ½” Throat, 126 ¾” Between Uprights. Sturdybender mdl. AA4 13GA x 4’ CNC Press Brake s/n 4021 w/ Autogauge CNC1000 Controls and Back Gaging, 50” Bed Length, 6” Throat, 38” Between Uprights. Edwards mdl. 3-5/1250 0.135” x 49.5” Power Shear s/n 737801208 w/ Newall DRO, Motorized Back Gage, 40” Squaring Arm. New Dimension mdl. P6.250 ¼” x 6’ Power Roll s/n 06941418 w/ 40” Dia. Initial Pass, 7” Rolls. Scotchman mdl. 6509-24M 65-Ton Ironworker s/n 321M688 w/ Punch 1 1/16” thru ¾”, 2” Punch Stroke, 9” Punch Throat, 24” Flat Shear, 1” x 6”, ¼” x 24” Cap, 6” x 6” Corner Attachment, Coping Notcher Attachment, Punch Dies w/ Cabinet. Strippit “Super 3030” 30-Ton Duplicator Punch Press s/n 177512579 w/ 48” x 72” Table, Fence System. Parker mdl. 632 Hydraulic Pipe Bender s/n 0845S w/ Bending Dies, Roll Stand. Empire mdl. FE1530-12 15’ x 45’ x 12’ Dry Blasting Room s/n R-96705 w/ 2-Double Roll-Out Doors, Man Door, Empire Automatic Auger Sand Recovery System, Clemco Carbon Monoxide Monitor, Torit mdl. T3-24 12-Element Dust Collection System s/n TG397083-001, Sand Blasting Guns, Safety Equipment. Bonanza FDG50 53’ x 18’ x 12’ Enclosed Paint Booth w/ Roll-Down Front Enclosure Screen, Bonanza Dust Collection System, Lighting and Ventilation. (2) 14’ x 10’ x 12’ Open Faced Paint Booths w/ Lighting and Ventilation. 20’ x 34’ x 10’ Gas Fired Drying Room w/ Double Front Door, Man Door, Lighting and Ventilation. (5) Demmeler 1m x 2m (39.5” x 78.8”) and 1m x 1m (39.5” x 39.5”) Precision Forming Tables w/ Angle Fixtures, Squaring Fixtures, Height Blocks and Clamps. Weldsale 5’ x 10’ (2) and 4’ x 6’ Acorn Style Forming Tables. Hyd-Mech M-16A 16” Automatic Hydraulic Horizontal Miter Band Saw w/ Hyd-Mech Digital Controls, Hydraulic Clamping and Feeds, Conveyors, Coolant. Hyd-Mech S-20 12” Miter Horizontal Band Saw s/n 20590612 w/ Hyd-Mech Controls, Speed Clamping, Work Stop, Coolant. Scotchman mdl. 350LT 12” Miter Cold Saw s/n 2607-0494 w/ Speed Clamping, Conveyor. Acer Ultima 3VK Vertical Mill s/n 9366917 w/ Mitutoyo DRO, 3Hp Motor, 60-4500 RPM, Chrome Ways, Power Feed, 10” x 50” Table. 2008 Willis “Big Bear” mdl. RD-1100 12” Column x 32” Radial Arm Drill s/n TY-080381 w/ 19.5” x 25.5” x16.5” Fixture Base. DoAll mdl. D10-3 10” x 30” Automatic Surface Grinder s/n 168-62123 Enerpac 30-Ton Cap Air-Over- Hydraulic H-Frame Press. Rockwell mdl. 20 Variable Speed Pedestal Drill Press w/ 200-2000 RPM, Power Quill Unit. (3) Burr King mdl. 760 2” Pedestal Belt Sanders. 1997 Rothenberger “Supermatic 2000-22A” Power Pipe Threader w/ Dies. Ingersoll Rand SSR-EP75 75Hp Rotary Air Compressor s/n F12003U95076 w/ 320 CFM @ 125 PSIG. Gardner Denver “Electra-Screw” 75Hp Rotary Air Compressor. 5Hp Vertical Air Compressor w/ Roll-Stand. Greenerd No. 3E Pedestal Arbor Press w/ Speed Wheel. Briggs & Stratton 5000 Watt Gas Powered Generator. Miller Maxtron 450 CC/CV DC Inverter Arc Welder s/n KD532312 w/ Miller 60-Series Wire Feeder. Miller Invision 352 MPa Auto-Line Series Arc Welding Power Source s/n MC220584U w/ Miller D-74 MPa PLUS Dual Wire Feeder. Miller Dynasty 350 Arc Welding Power Source s/n MA020211L. Miller Dynasty 200DX Arc Welding Power Source s/n MA300198L w/ WeldTec Cooler and Cart. (6) Miller Millermatic 350P Arc Welding Power Sources s/n’s LK030184B, LK030183B, LH060561B, LG380621B, LG380619B, LF471108B. Miller Syncrowave 350LX Arc Welding Power Source s/n LG480135L. Miller Syncrowave 250DX Arc Welding Power Source s/n LF135775 w/ Miller Coolmate-4 Cooler. Miller Deltaweld 302 CV-DC Arc Welding Power Source s/n KF898988 w/ Miller S-60 Wire Feeder. Miller CP-302 CV-DC Arc Welding Power Source s/n KJ186164 w/ Miller S-22A Wire Feeder. Miller CP-300 CV-DC Arc Welding Power Source s/n JK694332 w/ Miller S-52A Wire Feeder. Miller Millermatic 200 CV-DC Arc Welding Power Source and Wire Feeder s/n JJ414665. (2) Hypertherm “PowerMAX 900” Plasma Cutting Systems. Nelson TR-850 Nelson Stud Welder s/n HD659354 w/ Gun. TRW Nelson Series 4000 mdl. 101 Stud Welder w/ Gun. Walter “Surfox 203” Weld Cleaning System. 6’ x 8’ and (3) 6’ x 7’ Steel Welding Tables. Mitutoyo 40”, 24” and 12” Digital Calipers. Mitutoyo and Starrett Gage Block Sets. Megger MIT300 Digital Insulation Tester. Portalevel Industrial NSN6680-99- 192-2735 Ultrasonic Level Meter. eOmega HH501DK Type K Digital Thermometer. Extech “Easy Way 31 Digital Light Meter. Meyer Pin Gage Sets .061”-.250”, .251”-.500”. 24” x 36” x 5” 2-Ledge Granite Surface Plate w/ Stand. 18” x 24” x 4” Granite Surface Plate w/ Stand. 2012 Ford STX F-150 Pickup Truck Lisc# 34836H1 w/ 3.7L “Flex-Fuel” 6-Cylinder Gas Engine, Automatic Trans, AC, AM/FM/CD, 26,144 Miles, VIN# 4FTMF1CM2DKD37686. 2002 Chevrolet 3500HD 12’ Stake Bed Truck Lisc# 6V03053 w/ 8.1L V8 Gas Engine, Automatic Trans, AC, AM/FM/Cass, 167,652 Miles, VIN# 3GBKC-34G92M102670. 1997 Ford F-Series 21’ Stake Bed Truck Lisc# 5T26124 w/ Diesel Engine, Automatic Trans, Air Brakes, Dual Diesel Tanks, Side Utility Box, 158,512 Miles, VIN# 1FDNF80C6WVA35789. Caterpillar V155C 15.5 Ton Cap Diesel Forklift s/n 8TG00409w/ 2-Stage Mast, 70” Lift Height, Side Shift, Dual Front Pneumatic Tires. Caterpillar GC40KS1 7400 Lb Cap LPG Forklift s/n AT87A01819 w/ 3-Stage Mast, 201” Lift Height, Side Shift, Cushion Tires. Caterpillar C5000 4750 Lb Cap LPG Forklift s/n AT9011254 w/ 3-Stage Mast, 187” Lift Height, Side Shift, Cushion Tires. Caterpillar P5000-LP 4500 Lb Cap LPG Forklift s/n AT3511920 w/ 3-Stage Mast, 188” Lift Height, Side Shift, Yard Tires. 8’ x 20’ 3-Room Flammables Storage Container. Anver mdl. M150M-L W/L220M2-86 2200 Lb Cap Mechanical Vacuum Lifter. 2008 Anver mdl. M100M-L3P/6P W/L75M3-110 750 Lb Cap Mechanical Vacuum Lifter s/n S0080001472 w/ VSL-7 Vacuum Leakage System and Warning System. Contrx Crane 2-Ton Cap Floor Mounted Jib Crane w/ Jet 2-Ton Electric Hoist. Contrx Cranes 1 Ton Cap Floor Mounter Jib Crane w/ Jet ½ Ton Electric Hoist. Abel-Howe 1-Ton Cap Floor Mounted Jib. (8) 30” x 96” Hydraulic Lift Carts. Cantilever Sheet Stock Racks, Vertical and Horizontal.